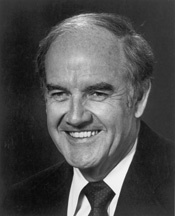 Back in his ’72 race for the White House, after news reports of his running mate, Thomas Eagleton, had a history of mental illness, McGovern famously expressed his support for his running mate, saying he was behind Tom 1,000%. Day by day, press coverage became ever more ugly. During a later press confernce, when asked if McGovern still supported Eagleton, the senator replied, “I’m behind him 100%.” It was a funny line and we laughed. Allow me to relate to you the real George McGovern, or as Paul Harvey used to say, “The rest of the story”. I honor George McGovern for his life of public service and his WW2 military service. During WW2 McGovern volunteered to serve in the United States Army Air Corps and flew combat missions in Europe. Most WW2 veterans held in German POW camps were his fellow aviators, by the way, and allied aviators died by the thousands. George was one of the lucky ones to survive. After the war, George went on to be a college teacher, U.S. Senator and a “compassionate liberal” focused on and expert on food and nutrition. Yes, his sentorial work expanded welfare, but I ask, where were the churches? Our political worldviews were polar opposites in most instances, but I honor Senator George McGovern for his selfless service to the people of the United States of America.